Located near Moosehead Lake in northern Maine, Big Squaw Mountain towers above the southwestern shore at 3,196 feet in elevation. As the skiing boom hit Maine, the Moosehead Lake region was not to be left behind. After a few years of fundraising, the Squaw Mountain Corporation decided to begin construction of a small ski area on the northern face of Squaw Mountain in 1963. Dedicated by Governor John Reed on December 28, Squaw debuted with 4 trails served by a half mile long, 600 vertical foot T-Bar and a rope tow. Kirk Ellsworth served as the first General Manager. Shortly after opening, Squaw Mountain Corporation director Harry Sanders III declared the area had exceeded expectations and that an expansion would be forthcoming. For its sophomore season, Squaw added a 243 vertical foot novice T-Bar, serving an additional new trail. Meanwhile, plans were being made to develop Squaw into one of the largest ski areas in the state. After flying under the radar for a few years, the ski area was dramatically expanded in 1967 with the installation of a double chairlift on the upper mountain. The new lift increased Squaw's vertical drop by about 1,100 feet to 1,700 feet, instantly making it the second largest ski area in the state by some metrics. Five miles of new trails were constructed, amounting to 41 acres of additional terrain. The new complex also resulted in an upper base area, anchored by a two story lodge. Two new trails were cut for the 1969-70 season with equity provided by Scott Paper Company, named East Branch of the Penobscot and Saint Croix. Meanwhile, a new hotel was being constructed adjacent to the upper base lodge. The Scott Paper Company purchased the ski area in 1970 with the intention of developing it into a wilderness resort. The new Squaw Mountain Lodge was dedicated in July by Governor Kenneth Curtis, featuring nearly five dozen rooms and an indoor pool. Duane Lander, who had helped build the hotel, was hired in August of 1970 and quickly promoted to General Manager of the ski area. Scott's first investment in the ski area took place starting that same off-season with the installation of top to bottom snowmaking on the Penobscot Trail and lower T-Bar area. At the time, it was billed as the largest snowmaking installation in the east in terms of vertical feet covered. The snowmaking system was improved for the 1972-73 season by tapping into Mountain View Pond and replacing 4 inch pipe with 8 inch. After losing $250,000 in 1973-74, Scott Paper Company decided to get out of the ski business. 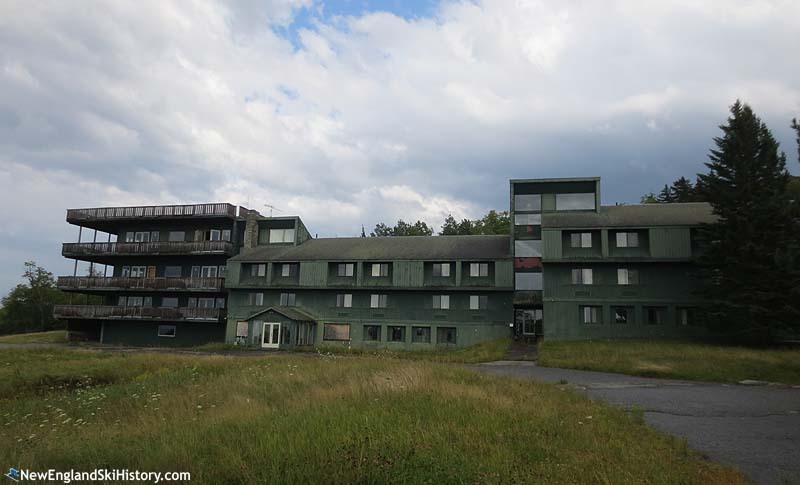 Not finding a suitable buyer, the Scott moved to paid off $1.1 million in Maine Guarantee Authority debt and unload the ski area. 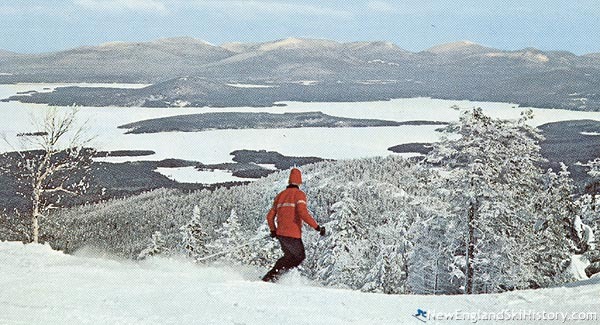 In the fall of 1974, the Scott Paper Company gave the 2,300 acre Squaw Mountain ski resort to the State of Maine. At the time of the transfer, the resort was valued at $3.5 million. General Manager Duane Lander then leased the area from the state, eventually signing a 10 year agreement in 1976. Aside from the construction of a small beginner slope and lift, subsequent years did not see much in way of changes to the alpine ski area, as the lack of ability to develop real estate infringed upon revenue generation possibilities. Cross country skiing, however did see additional focus, as the trail network was doubled in size for the 1977-78 season. 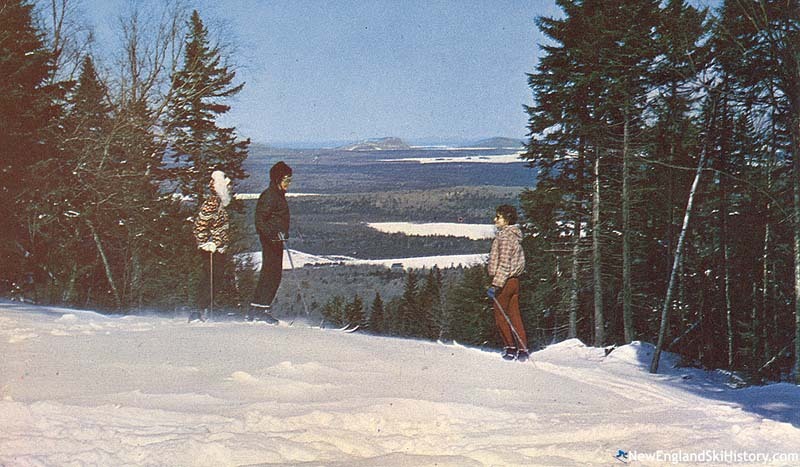 Circa 1980, the Maine Bureau of Parks and Recreation decided Squaw Mountain should be sold. Five years later, Maine accepted bids, choosing two finalists. Lander was one of those finalists, proposing to invest $5 million over the next decade. The other finalist, Lutz Wallem, was chosen by the state. Wallem's bid was contingent upon selling a business in Massachusetts, which did not occur in time, thus ending the deal. The state put Squaw back up for bid the following year. 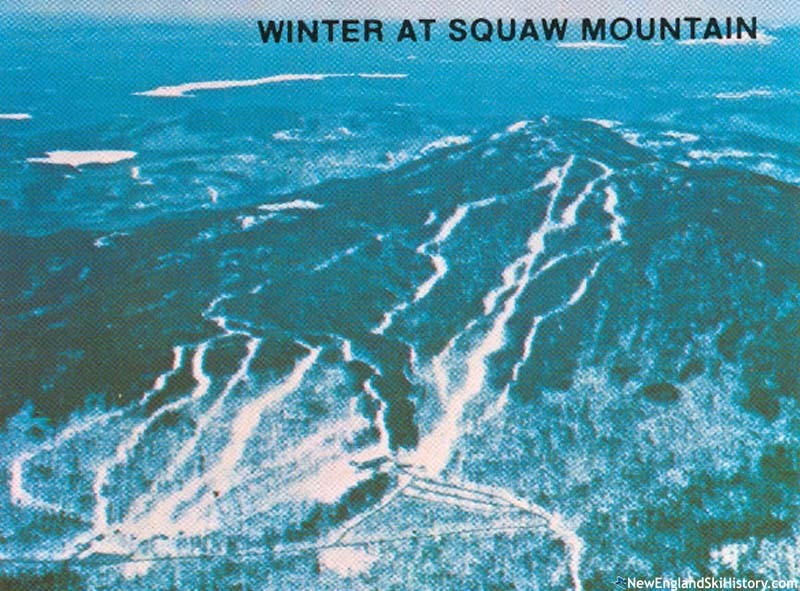 In the fall of 1986, the State of Maine sold the ski area to The Big Squaw Mountain Corp. for $300,000. 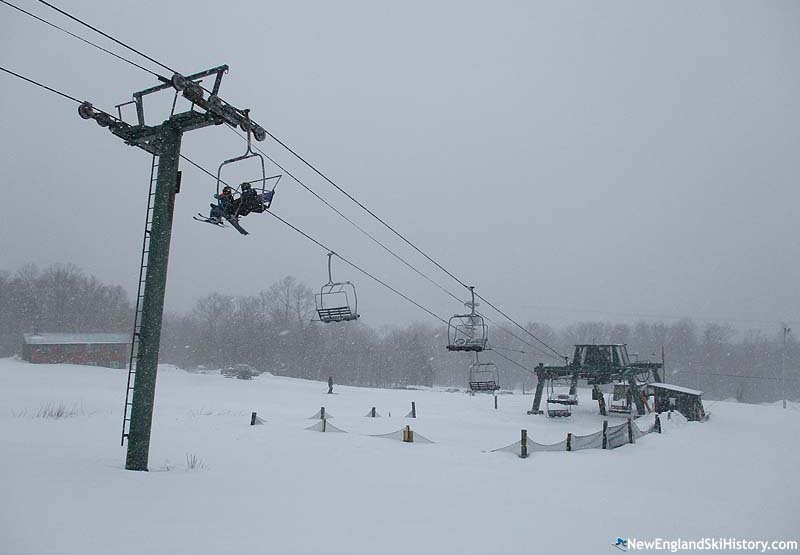 Led by Lander, The Big Squaw Corporation agreed to invest hundreds of thousands of dollars into the ski area that fall, including installing a $440,000 new Borvig triple chairlift on the lower mountain. The Big Squaw Mountain Corp. went bankrupt in the spring of 1990, leading to a bankruptcy auction that summer. The area was sold to a group led by Big Squaw Mountain Corp. President James Clair Sr. at the bankruptcy auction in August of 1990. Big Squaw was subsequently renamed Moosehead Resort and Ski Area. In March of 1991, Pam and Terry Kimball were named Co-General Mangers. Prior to the 1991-92 season, the Kimballs were awarded a long term lease of the ski area. One of their first moves was to rename the area to "Moosehead Resort on Big Squaw Mountain." Rodney Folsom, Mark Gilbert, David Amrein, Burdell LaCasce, Wallace Raubenheimer, and Chris Raubenheimer leased the area for the 1992-93 season, likely operating only the lower mountain as Ski Squaw on Big Squaw Mountain. Carolyn and Tom Hendrickson took over operations for the 1993-94 season, likely reopening the upper mountain. 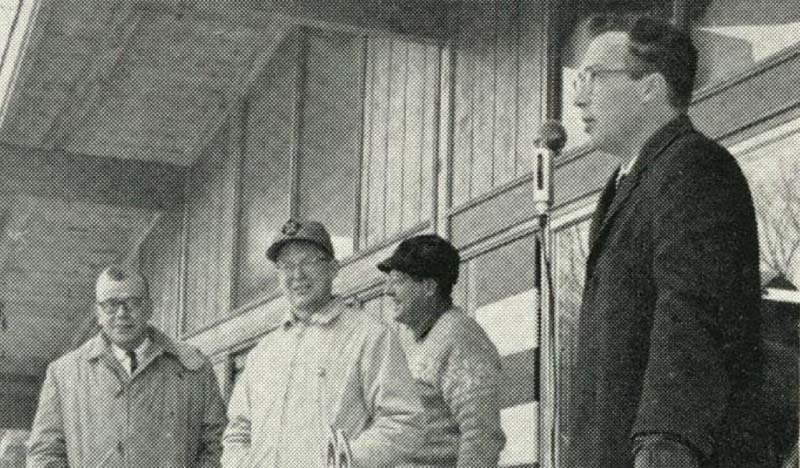 In January of 1995, James Confalone purchased a lease of the ski area. He later acquired the ski area in August of 1995 for $500,000. Despite government pressure in 2000, Confalone refused to rename Big Squaw Mountain ski area during a time in which Maine government controlled names with "squaw" were generally changed to "moose." On March 7, 2004, a chair grip on the upper mountain double chairlift failed, resulting in four injuries. As a result, lift served skiing on the upper mountain ceased. The hotel may have remained in operation as late as 2006. In August of 2010, Confalone offered Piscataquis County a $1 per year, 30 year lease on the ski area. The county did not accept the offer. The ski area did not operate in 2010-11 or 2011-12. The ski area made headlines again in 2012, when the Maine Land Use Planning Commission claimed Confalone had illegally harvested timber. Confalone claimed the timber harvest in question was pursuant with the land agreement, which allowed for clearing of ski trails. Starting in 2012, a group named The Friends of Squaw Mountain procured a $1 per year lease from Confalone and worked to reopen the ski area with many donations and volunteer labor. After sitting idle for two seasons, Big Squaw reopened with its triple chairlift on February 10, 2013. Momentum continued to build with improved base facilities for the 2013-14 season, resulting in 70 days of operation. Snowmaking returned to Squaw in 2014-15 when used fan guns were procured. On August 1, 2016, the State of Maine filed suit against Confalone's Moosehead Mountain Resort company, alleging the owner hadn't maintained the lifts and trails for "continued public use," as well as citing improper timber harvesting on the propery. Word emerged in early 2017 that The Friends of Squaw organization was debt free and that a preliminary study had been done for the replacement of the upper mountain lift with a new fixed grip quad. Meanwhile, a private snowcat ride service for the upper mountain was launched with funds going to the Upper Mountain Trail Fund. For the 2017-18 season, The Friends of Big Squaw Mountain acquired 30 more snow guns and also renovated the base lodge. "My family and I have so many memories with this mountain. My Dad skied here as a kid in the 60s and 70s and then brought our family here to ski in the 90s up through to 2004 when the lift failed. It was devastating for us! We would spend every February vacation at our condo in Greenville skiing Big Squaw, no matter the weather conditions. We were so happy to see the mountain reopen and are very greatful for the Friends of Squaw and all the work they have put into the mountain to make it what it once was. Our father has recently passed away and it is our dream to see the top of the mountain open again so that when we have children of our own, we can continue our tradition and teach them how to ski on this beautiful, family friendly, affordable mountain! " "I am so happy that Squaw has made a comeback! This is where I learned to ski! My family and I started coming here in the early 70's and we came all the way through th 80's until I graduated high school. We spent every February vacation here, even the years they were bringing in snow from the parking lot. The certified ski instructors were great, from Barbara, Kent, Chip, Earl...Some of my best memories there include running through the covered bridge, Barney the saint bernard, the pool, the live entertainment, Seeboomook, the Mayor's chair, the frozen "big t-bar", the torchlight parade, bombing down East Branch and then taking the last run of the day as slow as possible with only a ski patrol behind you. Best family vacations on record there." "I still have all my season passes from 1968 through 2004. Too many memories to share but everyone that was there knows what a wonderful time it was. It's exciting to see The Friends of Squaw Mountain bringing back the pure joy that is Squaw. " "ILOVE TO SKI,I AM THE PRESIDENT OF THE BLUE KNIGHTS. WE HAD THE FIRTS BLUE KNIGHTS INTERNATIONAL CONVENTION 1975, I STAYED IN ROOM 119, WE HAD A FANTASTIC TIME, THE PEOPLE WHERE GREAT. I HOPE TO RETURN FOR SKI THIS TIME. THANK YOU AND GOD BLESS YOU ALL." "I am responding to the comment above by Keith Miller, Jan. 29, 2016. Phillip Sheridan and his wife owned Squaw Mountain Inn on Moosehead Lake, Maine. I worked at the inn for the summer of 1960 between my freshman and sophomore years of college. I was then unmarried and my name was Betsy Carpenter. By that time Mr. Phillip Sheridan had died and Mrs. Sheridan was running the inn by herself. I do not recall her first name. Waitressing there was hard work. We had to work three meals a day seven days a week with an occasional meal off. I managed to get along with Mrs. Sheridan but many of my peers clashed with her. Guests stayed for several days and tipped at the end of their stay rather than tipping each meal so the tips were small. We were paid a small wage from which room and board was deducted. There was a girls dorm and a boys dorm behind the big inn. I had heard that the inn burned and just found a record of that fire on line. The fire destroyed a major part of the inn early on Sunday morning July 1, 1968. " "Our family was from Prince Edward Island,(Canada). I was about 10 years old at the time. Evey fall in the late 70's, we would get the Squaw Mountain brochure in the mail - and I would read it front to back. I think I even slept with it. Just after Christmas, our family (and others from the Island) would make the long drive to Maine, staying one night in Bangor at the Koala Inn (next to the kid-famous Ground Round). My fiends and I would be bursting with excitement when we arrived at the ski lodge. There was a friendly Saint Bernard dog that would greet you. For a week we would ski all day, only stopping for lunch to eat and play a video game (that we discovered would take Canadian Pennies as opposed to US Quarters). I feel guilty about that now. Rosy-cheeked from a full day of skiing, we would run the lodge hallways to the pool - swim and then hang out in the sauna. Starving, we would return to our rooms, dress, and make for the lodge restaurant through the famous covered bridge. I can't adequately tell you what that bridge meant to me. The cool air, the sound of running it's length as night set in, looking out windows over a frozen pond - it was absolutely magical. One of my very best childhood memories. You would then eat your face off - tiny loaves of warm bread and a salad bar were great. The next day - it was rinse and repeat. Sadly, you would have to go home, but with a smile and a Moose-head ski patch to show your friends back home. It is absolutely heartbreaking to see the resort abandoned now, with covered bridge gone, and smashed windows. I am actually welling-up in tears just writing this... If I ever make or win stupid money... my pledge to the great people of Greenville Maine is to buy the mountain, restore the lodge and rebuild the covered bridge...and then ski - dying a happy man! " "I have an envelope from my grandmother that has a return address of Squaw Mountain Inn, her husband was Phillip Sheridan from Maine, does anyone remember if he owned this skiing resort? It would have been early '60's as he met my grandmother and married and moved to San Francisco." "In the early 70s I taught skiing on Squaw and it was a wonderful mountain to ski, both esthetically pleasing and physically challenging. I have many fond memories of the friends and ambiance of the mountain. Seeing it come back to life through dedicated people is just plain awesome." "I worked In the Kitchen Back in 1969 & 1970, Also mulched Hay on Trails to grow Grass. The Colored Rain used to play on the week ends, it was good times.Lots of Memories"
"Squaw Mountain was a second home for me, too, and the stage for various coming of age passages. 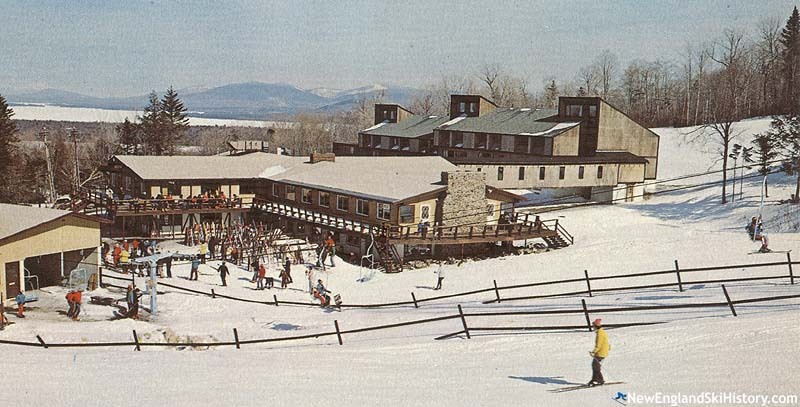 I started skiing at four, at Ski Horse outside of Bangor, and my dad took our family to Squaw as soon as it opened. We had a place in Little Squaw township --- fond memories of the drive with Henry Prescott or Chick Adams who stayed in the cache with us, and neighbors D'Amicos, Trenholms, and Fendlers. Fond memories of instructors Dave Pierce, Scott Richardson, and Earl Thompson. Fond memories of Junior Masters travels to contests with kids from the families Gerrish, Ellis, Durham, Greenquist, Wentworth, and McKusick. We all enjoyed so many years skiing, marking middle school and high school vacations. When I eventually traveled through the US and Europe for competition, I was so pleased to announce that I was from Squaw Mountain on Moosehead Lake in Maine! That was some forty years ago, now. Lately, I'm pleased to see the amazing work done by The Friends of Squaw Mountain. Way to go! Keep at it!" "We started sking Squaw Mountain around nineteenseventy three ,learning to ski on our own and bringing friends up for a new sport , my now wife kept saying we need lessons , I in reply kept telling her we skied better then most people on the mountain ,we still laugh about that .We were around medium expert at the tome with no lessons. What a great mountain and so many young memories. Thank you Squaw mountain ." "I skied Squaw during the 1968-69 and 1969-70 seasons. At that time Dave Pierce headed up week-long race-training camps for kids during the Christmas and mid-winter school breaks. I attended all four of them and had a blast. " "1st skied Squaw back in the early 70's. Remembering High School meets on the Mountain, the Passenger Trains were still running from Montreal into Greenville Junction at that time and on a nice weekend the Mountain had upwards of 1100 people skiing. Sad to have such potential lost. The Mountain has such character and SUPER skiing, breathtaking views, easy accessibility, and you know, had it been managed properly (and not throwing dispersion's,as properly means having the capital to have repaired, replaced and relaunched), what a different and vivacious piece of Maine Recreation this Gem would have continued to evolve into. It is sad. I still ski and so does my family. It's a real loss. " "In 1966, owner Colby Russell hired my father Normand Martin to prepare the "
"Remembering back to 1980's Squaw Mountain was one of the first mountains I had skied, had the greatest time back then and am still skiing today. Now I know it is open I can bring all my kids who are all grown up and all ski and along with all my Grandkids whom can ski faster down the mountain than me, I know I can't go as fast with them now, nor keep up since I am older and am in my 60,s, but I love taking my time now and enjoying the views from atop Squaw Mt., I am really glad to see that Squaw Mountain has Re-Opened, This is Great News, I know everyone who goes to Squaw Mountain will have the Greatest Time and Views and Fun, Enjoy to Your Hearts Desire and Merry Christmas and Happy New Years"
"It was in 85 I first skied Squaw fell the hole way down LOVE IT. Spent next 4yrs working,skiing,and making great friends from all over the states and countries. Best time in my life.Best of luck bring it back to what it was!" "Started skiing Squaw in '63 and had season passes there till I graduated from HS. Some of my favorite childhood memories involve the mountain. Good times, great skiing." "What wonderful memories. That first year I worked in the ski school with Dave Pierce. This opportunity opened many doors for me. Even though I moved over to Sugarloaf, I still think back to the those early years at Squaw. Keep up the good work." "I hiked up there in the summer of 2012 bc a local suggested it saying it was a scenic hike. Scenic though it may have been as soon as I saw the utterly abandoned and destroyed hotel I turned around and left. Nice view but very creepy. It looked like it could have been a really nice place at one point!" " Squaw Mt. known for its scenic view of Moose Head Lake is Most scenic in New England.The runs have some of the better vertical in the state of Maine.The mt. 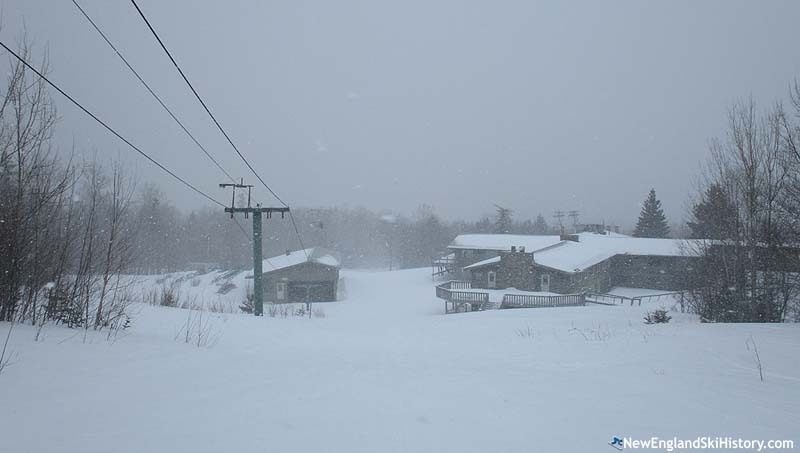 itself has different powder and snow conditions for any boarder or skier.The recent re opening of Squaw is a start of skiing in upper Maine. If you want good skiing at low key area go to Squaw.It is conveniently located near Greenville for shops ,food and activities." "In 1977 my wife(7 mo pregnant)and friends went to squaw mt. Had the best time! my wife made only one run but enjoyed the moment." "Grandchildren just starting to ski. Started a conversation with my children about the wonderful winter vacations we had at Squaw when they were learning to ski. What a deal it was!! What great memories....."
"When growing up in the 70's, Squaw was like a second home to me. I remember in 1976, as part of the USA bicentenial celebrations, I bought a season's pass for $76. I think I still may have the pass. I also enjoyed snowmobiling from my family's camp on Indian Pond over to the lodge on weekends for some nice times in the lounge listening to music and dancing late into the evenings. I miss it !"